KeePass is a good desktop password manager tool to manage our password. I highly recommend you to use this method to keep all your login details instead of using an online password manager tools. If you use KeePass then you will know that we have to do a lot of manual work with this application to login to any website. It involves searching for an entry, copying and pasting those entries on to our browser. This is a really boring task, and it takes some time to do all these tasks. If you don’t like to do all those work, then here is a solution for Chrome browser users. With this method, we can automate this process. ChromeIPass Extension is a Google Chrome extension to integrate your KeePass with your Chrome browser. Once you integrate, ChromeIPass extension will fetch login details like username and password from KeePass application when you visit any login page URL. 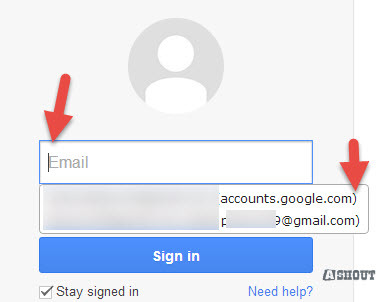 If you have provided more than one entry for the same login page, then it will offer you to select the username which you need to login to that page. To select username just click on the username field, it will display the suggestions. Choose the account that you need to log in. You can also select it by clicking the ChromeIPass icon on your browser. To make this ChromeIPass extension to work, you need keepasshttp plugin to be installed on your KeePass application. 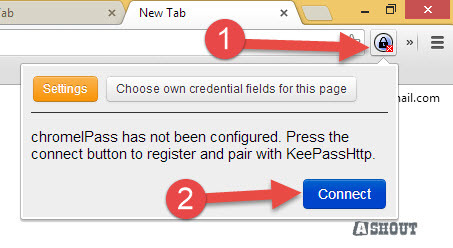 To fetch login details from KeePass, you need to open KeePass application to work ChromeIPass extension. It gives a suggestion only when visited login page URL matches with entered login page URL on your KeePass application or else it won’t work. 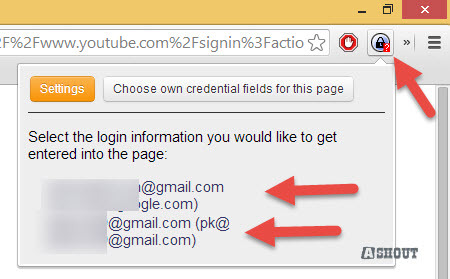 So make sure you have entered correct login URL address on your KeePass tool. These are the three things that you should need to know when you started using the ChromeIPass extension. 1. To install ChromeIPass first download latest version of KeePass software and install it. 2. After installing KeePass, download keepasshttp plugin for KeePass software and extract that folder. Once you extract you will see KeePassHttp.plgx file. To install that plugin copy that file to your KeePass installation directory. 3. Verify installation by opening KeePass >>Tools>>Plugins and look for KeePassHttp entry. 4. Now install ChromeIPass extension on your Chrome browser. 5. Click the KeePass icon in the URL bar of your Chrome and click the “Connect” button (open your KeePass application before clicking connect button). 6. Now switch/open KeePass application, you will notice a pop-up window asking for a name. You can give any name here and click save button. 7. 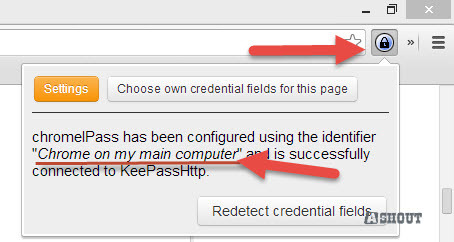 To verify whether you have properly connected your KeePass database with ChromeIPass extension, click on the ChromeIPass icon on your browser and look for the Key name that you have given in 6th step. If you see that name, then you have properly connected and everything is working fine. Now we have installed ChromeIPass and configured to work with our KeePass application. To check the working of this extension, visit any login page and you will see login suggestion on your ChromeIPass icon. ChromeIPass is a good chrome extension which helps to automate entering username and password filed based on the URL that you visit. If you are a Chrome browser user and use KeePass password manager, then this is a must-have tool for every user. I don’t know what you are missing… Currently I’m using Version 2.24 and it is working fine for me. Maybe, you can try that version itself. Still a great tutorial otherwise. Yes. You are right. Thanks for updating here. I have the same issue. The KeePassHttp.plgx file is not shown under plugins, nor is the alternate DLL files displayed (alternate approach). I note that under Program Files(32), my directory is KeePass Password Safe (but no 2 after it). And, yes, I upgraded to the latest KeePass software. For those who this may help – check the size of the plugin; it should show @ 396KB for the 1.8.4 version. I noticed mine was under 4oKB somehow…I downloaded again and got the “correct” download size…. Perfect tutorial, I was wondering how the plugin would work. Thanks a lot! Does it work with portable version of keepass? Hello there. How do I do this for three domain entries. For example, username, password1 and password2. just copy the same entry in keepass with different pass that’s it. I cannot get this to work if I have a proxy script enabled. I have to have the proxy on. How can I make ChromeIpass talk to KeePass? I’m not sure about it. Check their documentation or contact their support team. I followed your steps to integrate ChromelPass, but it doesnt work. I am not a programmer just a retired oldie who wants to use a password memory on the laptop. KeyPass is working on Firefox and I wanted to use Chrome instead, but I think I’ve missed something in the installation. Do you really have only one installation of KeyPassHttp in your KeyPass-Directory? System.Nett.HttpListenerException (0x80004005):Failed to listen on prefix ‘http://localhost:1945/’ because it conflicts with an existing registration on the machine. When I close the box I’m prompted to enter my password to start as usual, and it starts as normal in Firefox. This tutorial is for Chrome browser so If you ask your question related to chrome browser maybe I could help. I guess you are missing plugin installation location. In the latest version, the plugin needs to be installed at C:\Program Files (x86)\KeePass Password Safe 2\Plugins not in C:\Program Files (x86)\KeePass Password Safe 2\ as explained in this article. yes I’m trying to use chrome browser instead of Firefox. I’m not sure what you are missing. If you follow the above instruction correctly it should work. Double check whether you followed all instructions correctly or not. Try double checking below points as well. 1) Did installation is done correctly? 2) Does your Kee pass software is connected to chrome browser successfully? Without seeing error picture it could be difficult to troubleshoot. Maybe if you share full screenshot I could try to help. thanks for the thoughts on my problem. No indications of faulty installation were shown when I followed your instructions, so I have completly un-installed both the chromel installation and all the plugins, the Keepass software and removed the Keypass from my laptop. I first saved a copy of my keypass database with my passwords. I have also removed the addon to Firefox, so I’m now without a password manager of any kind. My question now is, can I reinstall, and use the keypass with both Firefox and chrome? I expect that to do that I will have to install first keypass, and then the different addons for each of the two browsers? Will this work? I hope you can advise me on this as I really want to use both browsers with a password manager, and one manager for all would be best for me. Yes. You can always connect your KeePass with Chrome and Firefox (I haven’t tried) as and when you require. The only requirement is, make sure you have KeePass database. Yes. You are right. First, install KeePass software on PC and then install Keepass addons on different browsers. To my knowledge, it should work in both browsers. I haven’t tested it personally as I always use chrome. In most cases, it should work without any issues. Many thanks for your help. I will now go ahead and see how it goes.